SUPER COMFORTABLE: A loose fit through the hip and thigh gives them a cozy yet fitting look. Premium denim and a natural fit that sits 3 inches below the natural waist makes these jeans super comfortable. FLEXIBLE & FIGURE FLATTERING: These stretch jeans look great on any figure! A relaxed stretchy cotton & spandex blend perfectly fits on your hips and leaves room for you to breathe and move around with ease. EASY FIT: Comfort is combined with style to create your new favorite jeans! A zipper closure, a mid-rise fit, and boot cut lend a comfortable look and feel that makes you want to wear them all day long. Don’t sacrifice comfort for style! Jeans are a wardrobe staple for everyone but finding a pair that look great and fit great too could be a challenge. 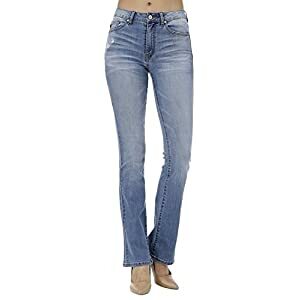 With the Midrise Bootcut Women’s Jeans from Blue Star you’ll be able to look just as good as you feel. Our denim pants are made from superior denim that gives them a classic look and makes them easy to wear all day long. These will quickly grow to be your new favorite pair of jeans. Constructed from a super soft and durable cotton that makes them easy to wear all day long with ease. With a relaxed fit they sit 3 inches below your natural waist and easy through your hips and thigh. You can never wish to take them off! With a classic look our jeans will never go out of style. Distressed details lend them a rustic charm that perfectly complements anything in your wardrobe. A whiskered and sanded detail at the front gives them a stylishly worn-in look. Easily dress yours up or down. Pair yours with anything from sneakers to high heels. They effortless take you from season to season and will also be worn all year round. Our trousers are figure flattering and designed to look amazing on any shape or size. They easily shape and hug your thighs and hips. You can feel like they were custom made just for you! Blue Star apparel is made from the best quality material. Every garment is made with quality craftsmanship to provide comfort and long lasting durability. Discover the style and comfort of our jeans and never look back! FLEXIBLE & FIGURE FLATTERING: These stretch jeans look great on any figure! A relaxed stretchy cotton & spandex blend perfectly fits on your hips and leaves room so that you can breathe and move around with ease. EASY FIT: Comfort is combined with style to create your new favorite jeans! A zipper closure, a mid-rise fit, and boot cut lend a comfortable look and feel that makes you need to wear them all day long. CLASSIC LOOK: In case you are on the lookout for the perfect pair of faded or washed jeans, look no more! Our distressed pants feature a classic design that never goes out of style and looks great with practically anything. QUALITY, EASY CARE FABRIC: Made from superior denim material, these blue and black jeans are designed to be long lasting and stylish. Easily wash these pants without worry about them shrinking or fading.